Our Wine Maker - Pillitteri Estates Winery Inc.
Aleksandar our wine maker joined the Pillitteri team at the beginning of the 2010 harvest and brings with him 20 years of experience and expertise in wine making. 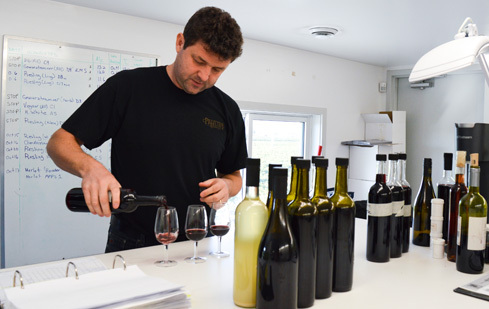 Previously, he has worked with Vincor Canada as a VQA Winemaker since June 2004 and previous to that with Hillebrand Winery as a Winemaker and Lab and Cellar Technician commencing in 1996. Aleksandar received his Bachelor of Science at the University of Zagreb, Croatia and his Honours Bachelor of Science in Biotechnology at Brock University. Aleksandar’s proficiency in HACCP and his ISO program knowledge is also valuable for Pillitteri to continue with the production of secure and quality VQA wine making. Alex has instituted an austere and meticulous policy for monitoring and classifying wine produced at Pillitteri. In combination with his talents to sample and blend wine, Alex and his team utilized a set of strict criteria to classify wines to designations. Alex and his team adhere to these criteria based on three key influencers of wine quality. The key criteria consists of; the growth of the grape in the vineyard, the pressing and fermentation of the wine in the press house and the ageing and blending of the wine in the cellar.